Anime producer Toshifumi Yoshida got his start in the anime and manga world during the late '80s as a founding member and staff translator of the gone-but-not-forgotten smartass anime magazine, Animag--although of course he grew up watching the stuff as a wee spanker living in Shizuoka, Japan. For over a decade, Toshi has been a video producer for VIZ Media, working at the home office in San Francisco and the recording studio in Vancouver, Canada. As of last year, Toshi completed the recording of the entire InuYasha TV series for both Cartoon Network's Adult Swim and for home video release. 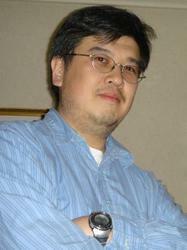 In October of 2004, Toshi left his full-time position at VIZ to continue his career as a contract translator, writer, and producer-for-hire. This allows him to work from home and spend more time with his wife, Trish Ledoux, and with their son, Hajime. Working from home or no, Toshi is still quite active in the anime and manga industry. He currently working as translator on the Negima! manga series from Del Rey, and on projects for other companies. As always, if you're looking for Toshi...try the bar first.